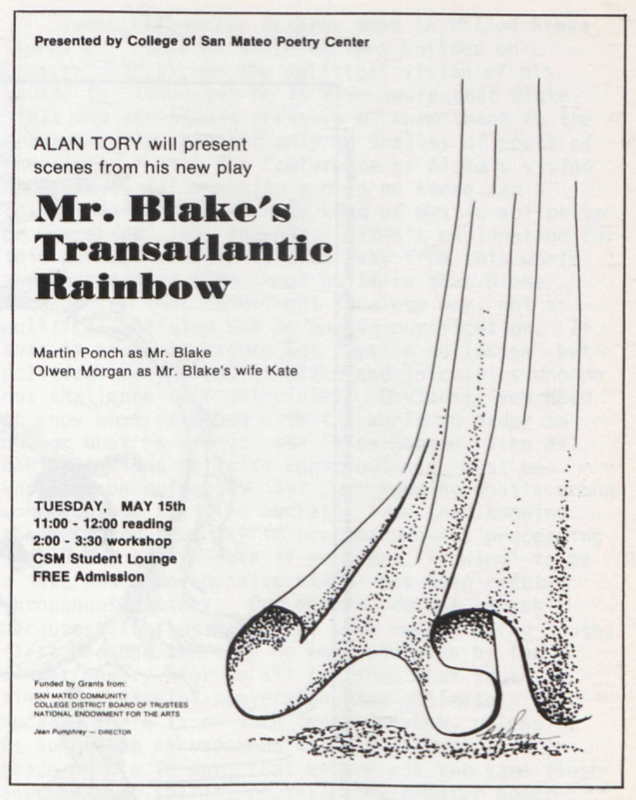 Readers presented two scenes from Alan Tory’s play, Mr. Blake’s Transatlantic Rainbow, at the College of San Mateo (California) on 15 May 1979. A workshop followed. Characters in the scenes included Blake, his wife, Mrs. Tattle, Fuseli, Los, Orc, and Urizen. The reading was directed by Richard Rohrbacher. Blake was played by Martin Ponch, Mrs. Blake by Olwen Morgan. Tory is a former chairman of the Social Sciences Division of the College, and the author of several books and plays.